A Different Kind of Daughter | What Next? Sometimes you have to go in the wrong direction to find the right one. Start looking around. You might notice a fork in the road. I see them all the time myself. Open your eyes. I know that many people have many ways to reach one God. I like to know what they all are. Everyone must find the way for themselves or they will be lost. Believing in luck is a curse. I just believe. Getting down on your knees will not make you more pious. Your brightest temple exists with you. I kept a pencil in hand to make notes as I read A Different Kind of Daughter by Maria Toorpakai. The father of the main character has so many astute observations and insights and I didn’t want to forget them. 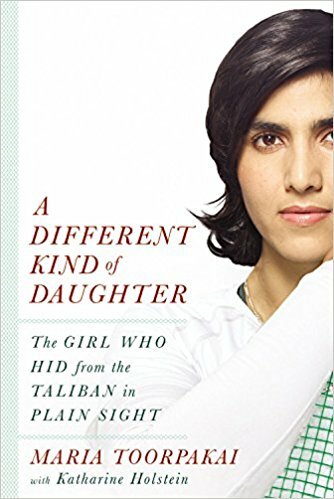 A Different Kind of Daughter is a memoir of a girl growing up in Pakistan and becoming an accomplished squash player. She escapes the Taliban and comes to Canada where she continues to play squash and has started a foundation to help educate girls in countries like hers where they experience oppression. I think Maria’s father is definitely the hero of this story. He goes against all the laws in his country often risking his job, safety and family connections to be sure his daughters will have fulfilling meaningful lives pursuing their passions and dreams. Not only is Maria’s father her number one supporter he is also a great dispenser of wisdom as the quotes above illustrate. Her father’s words and example continue to inspire Maria now that she is apart from her family. They will inspire you too. Must We Live in Fear?